What would seem to be the easiest part of marathon training has been, by far, the most challenging. The taper portion of marathon training is designed to repair muscle damage, minimize fatigue and in general refresh your body. Tapering usually begins 2-3 weeks before the marathon and after the longest run of training. For me it should have begun after my 22 mile run, but it didn’t. Truth be told I ignored all advice, training plans and proven research. I didn’t really taper. 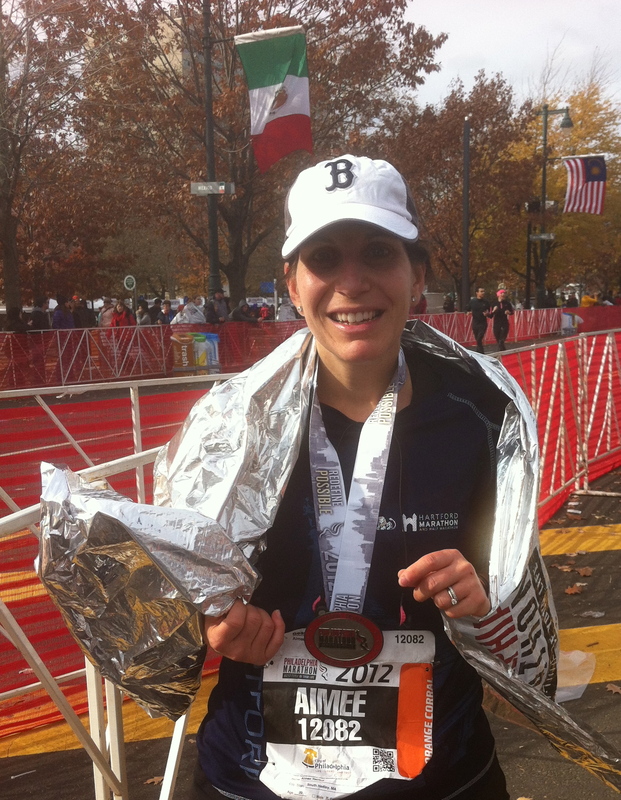 I fell into a trap that is not uncommon for a first time marathoner. I was too afraid of losing my level of fitness so I compensated by continuing to run. Also as someone who struggles with weight the taper period couldn’t have come at a worse time, the holidays! Confronted with sweets, desserts and other seasonal treats I caved and relied on running and exercise to maintain my weight so that I could enjoy the more than occasional bite. I did decrease my mileage, just not as much as I should have. I also didn’t care for my body the way that I should have in these last few weeks pre-marathon. So for those of you thinking of running a marathon or other race do not take a page out of my book. Do read this article at Runner’s World, “It’s Taper Time” by Bob Cooper. Sunday, 12/25/11 Long Run Christmas Day became a rest day and mostly a day of carb loading! Monday, 12/26/11 3 Mile Run 13.1 Mile Run – I felt horrible and reacted to overeating by over-running. As you can see I was a bit all over the place. This mirrored my life last week. Everything about last week was all over the place. It’s no secret by now that I overdid it this holiday season. Wow did I pay for it with headaches, bloating and moodiness. My husband was off on Monday. My son was on school vacation. My Dad was visiting from Florida. My mother was on vacation. Everyone wanted to spend time with Carlos but on their schedules not mine. Speaking of which, in a fit of temporary insanity I picked up 3 extra shifts last week. The money is good, at the time I picked up the shifts my husband was laid off, plus I figured I would have lots of extra hands around to help me with Carlos. This is a luxury I never have and the same rang true for last week. By Thursday, my only day off, I was definitely ready for a rest day. In fact I was so ready I fell asleep around 7pm shortly after putting Carlos to bed. Ridiculous! I have learned a lot about marathon training this week and a lot about myself. I have made grave mistakes which I will not do again, should there be a second marathon. I ran my last long run yesterday on New Year’s Day. I, of course, screwed up and ran more than I should have and more than I was scheduled to run because I took a different route. What’s done is done. Time to move on. Today I came home from work and cleaned my house from top to bottom. My husband was off from work and he helped a lot. Are we the only weirdos that do this before going away? I love the feeling of coming home to a really clean home. I am going to try to get some packing done before I go to bed. Tonight is my last night of work for 12 nights. We have absolutely no plan for our time in Florida other than to go to Disney World and of course the marathon on Sunday. My Dad and his girlfriend are traveling to Orlando on Saturday to offer their support. I will be a spectator at both the 5K on Friday and the half marathon on Saturday to cheer on my friends. I am excited to attend the expo and see Disney through my son’s eyes. Most of all I can’t wait to cross that finish line. After the marathon we will be spending a little time with my Dad in Ft. Lauderdale. The break is much needed. I am feeling oddly calm at the moment about the marathon. In my heart, although I may not have trained perfectly, I know that I did my absolute best. I followed a legitimate training plan despite taking my own liberties to adjust it during these last few weeks. September threw an enormous wrench in my plans when I first broke my toe on my anniversary in Bermuda and then broke my rib after falling down the stairs at home less than two weeks later. I recovered and in some ways I think I’m stronger now as a result. As I explain to my 5-year-old son, I will not win this race by crossing the finish line first, I will win it because I will cross the finish line. He doesn’t understand why coming in first isn’t important. He will some day. For me this will be an accomplishment like no other. This is one of those things I adamantly refused to believe I could do. How many times did I say, “I can’t run” as though it was something to be proud of? The truth is I was jealous of those that did run or accomplish other major fitness goals. I always assumed I had to reach that perfect weight before running a race. I’m glad I stopped with that thinking. I’m still not at my goal weight or even a number close to it, but my body has changed so much in the last year and a half. I went down two sizes and now feel so much more comfortable in my own skin. I also used to feel as though I didn’t have the time. You know I’m busy after all! Well aren’t we all. I managed to work full-time and did most of my training on the three mornings my son is in preschool and on the weekends when my husband is home during the day to watch Carlos. I got up really stinking early on my Saturdays off to go for long runs if my husband had to work. Some mornings I was done with 10 or 12 miles by the time most people were just waking up. I stopped with the excuses and did something I never thought I could do. I really do believe that if I can do this so can anyone. It might not be a marathon. It might be a triathlon or a hike or playing golf. Whatever it is, don’t wait. Get out there and do it. You might just surprise yourself. I like to come home to a clean house as well–however I don’t always have the motivation to clean it before I leave! So excited to hear about your marathon! Whenever I get home from a race (and sometimes even just a run) my 5 year-old asks me if I won. I always answer YES! Getting out there and doing it is a win in my book, and I stopped competing against anyone but myself long ago. Thanks for sharing the taper article good stuff. Have a great marathon, very excited for you!